The series will cover the extraordinary story of the trailblazing era when country wide, the music of ordinary Americans was recorded for the very first time. American Epic will take us on a journey across time to the birth of modern music, when the musical strands of a diverse nation first combined, sparking a cultural renaissance that forever transformed the future of music and the world. American Epic will will release contemporary performances from The American Epic Series. Sony Music’s Legacy Recordings will release a series of archival recordings, featuring groundbreaking audio restoration of 1920s and 1930s recordings by Lo-Max Films, Nick Bergh and Peter Henderson. Jack White’s Third Man Records will release a deluxe box of vinyl records. British filmmakers, Bernard MacMahon and Allison McGourty, have pieced together this extraordinary story set in the late 1920s when record company talent scouts toured America with a recording machine and for the first time captured the raw expression of an emerging culture. The filmmakers follow the recording machine’s trail across the United States to rediscover the families whose recordings would lead to the development of blues, country, gospel, Hawaiian, Cajun and folk music – without which there would be no rock, pop, R&B or hip hop today. For the American Epic series the filmmakers have re-assembled the recording machine that allowed America to first hear itself. They have replicated the atmosphere of America’s seminal 1920s field recordings down to the smallest detail, with top American artists recording straight to wax, using all the original microphones, amplifiers, and other equipment from that era. The American Epic sessions will feature The Alabama Shakes, The Avett Brothers, Beck, Frank Fairfield, Ana Gabriel, Rhiannon Giddens, Merle Haggard, Bobby Ingano, Elton John, Auntie Geri Kuhia, Pokey LaFarge, Bettye LaVette, Los Lobos, Lost Bayou Ramblers, Taj Mahal, Steve Martin and Edie Brickell, Fred Martin and The Levite Camp, Ashley Monroe, Willie Nelson, Charlie Kaleo Oyama, Blind Boy Paxton, Raphael Saadiq, and Jack White. 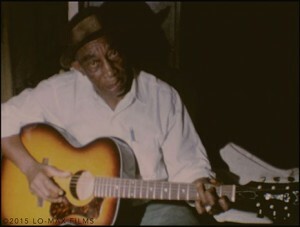 First ever color film footage of Mississippi John Hurt by K. Swerilas, here performing “Louis Collins”. Image from collection of Lo-Max Films Ltd. Among the contributors to the series are Richard Nevins, Sherwin Dunner, Joe Bussard, Pete Whelan, Joe Lauro, Michael Kieffer, Tony Russell and many more. American Epic will be available on DVD and Blu-ray and will also be available for digital download. For more information on the overall initiative click here for a website which is currently under construction. The social media hashtag is #AmericanEpic. This entry was posted in 45 rpm, 78rpm, Americana, Blues, Compact Disc, Country/Hillbilly, DVD, Film -TV, Jazz, Rare Records, Rhythm & Blues, Rock & Roll, Roots, Website, You Tube. Bookmark the permalink.